All rights reserved. Should not be duplicated elsewhere without acknowledgment of author/source (joancrawfordbest.com). Joan's time at Warners did not begin auspiciously. After rejecting three pictures and being turned down for one she wanted to do (Ethan Frome), Joan was threatened with suspension for refusing to work. She promptly marched into studio head Jack Warner's office and had herself taken off salary until a suitable script could be found for her. For over a year Joan did not appear onscreen. During this down time, she busied herself with family life. Months after her divorce from Franchot Tone in 1939, Joan had adopted a baby girl, Christina. In 1942 she had married her third husband, actor Phillip Terry. 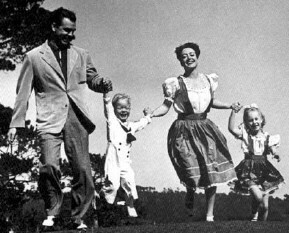 In 1943 the couple adopted a son, Phillip, Jr. (whose name would be changed to Christopher after the couple's 1946 divorce). Terry had recently been released from RKO and was working in his father's factory, so Joan now played the dutiful War Wife for the press, ceremoniously packing his lunches and seeing him off each morning. Her other war efforts included Sunday lunches for servicemen at her house, the organization of a day-care center for women who worked in war plants, and plowing over her "frivolous" flower garden in favor of a patriotic vegetable-filled "Victory Garden." She also made regular Monday appearances at the Hollywood Canteen, where celebrities mingled with servicemen and did more mundane chores like the dishes. Joan's 16-month onscreen drought ended in December 1944 with her brief cameo appearance in the movie version of Hollywood Canteen, which showcased the top Warners stars (including Canteen president Bette Davis). Joan's wartime drudgery was, thankfully, about to end. In February 1944 Warners had bought the rights to the James M. Cain novel Mildred Pierce, about a housewife who dumps her husband and subsequently works her way up from waitress to business-owner, all in the questionable name of making a better life for her amoral daughter. (Cain's Double Indemnity was currently a major hit for Paramount and Mildred thus a hot property.) Actresses Rosalind Russell, Ann Sheridan, and Barbara Stanwyck were all considered for the part, but the film's producer, Joan-friend Jerry Wald, sent Joan the script and upon her enthusiastic response lobbied for her to get the role. Director Michael Curtiz, thinking Joan a snooty clotheshorse, adamantly wanted the grittier Stanwyck. To convince him, Joan willingly humbled herself by doing a screen test sans much makeup or fancy wardrobe. She got the part. I was used to the look at Metro, where everything, including the war pictures, was filmed in blazing white lights. Even if a person was dying there was no darkness. But when I saw the rushes of Mildred Pierce I realized what Ernie [Haller, cameraman] was doing. The shadows and half-lights, the way the sets were lit, together with the unusual angles of the camera, added considerably to the psychology of my character and to the mood and psychology of the film. I decided that if I got it [the Oscar] I would feel goddam sure that I deserved it, not for just that one film, but for some other damned fine performances I'd given. Whether the Academy voters were giving it to me, sentimentally, for Mildred or for 200 years of effort, the hell with it. I deserved it. 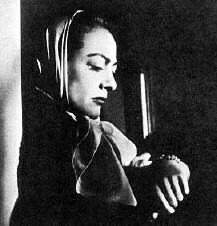 Joan Crawford won the Best Actress Oscar for Mildred Pierce. This triumph was followed by an equally rivetting performance in 1946's Humoresque, co-starring John Garfield as a violin protege whose talent is nurtured by Joan's lushly world-weary, ultimately suicidal Helen Wright. The string of well-acted, well-produced dramas continued in 1947 with Possessed, starring Joan as an emotionally unstable nurse who becomes obsessed with the callow engineer played by Van Heflin. Possessed, with its disturbing portrayal of mental illness, brought Joan her second Oscar nomination. Unfortunately, and predictably, the Oscar High didn't prove to be sustainable. Warners loaned Joan out to 20th Century-Fox for 1947's Daisy Kenyon, a rather pedestrian Otto Preminger-directed film that had Joan involved in yet another love triangle, this time with troubled war-vet Henry Fonda and married-man Dana Andrews. 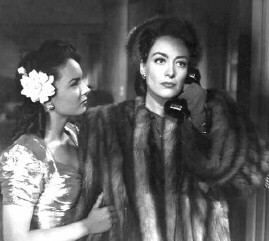 Joan sat out 1948 altogether for lack of good film scripts. 1949's soap opera Flamingo Road, co-starring Sydney Greenstreet, Zachary Scott, and David Brian and directed by Mildred's Michael Curtiz, is Joan's first film to venture slightly into camp, with Joan as a 40-something carny girl showing off her legs and confronting small-town politicos. The same year, Joan also made a brief, witty cameo mocking her recent screen personae, in the Doris Day-Dennis Morgan-Jack Carson vehicle, It's a Great Feeling. Here, she slaps Morgan and Carson for no apparent reason; when the bewildered men ask why, she responds, "I do that in all my pictures!" before jauntily saluting and walking away. Joan ended her years at Warners in a desultory fashion. She played a rags-to-riches gangster's moll in 1950's implausibly scripted The Damned Don't Cry. That same year, she asked to be loaned out to Columbia for Harriet Craig, a remake of a 1936 Rosalind Russell film. Joan's Harriet is a controlling housewife who tries to sabotage the lives of those closest to her so that they'll remain dependent on her; her subtly harsh performance is one of the most honest and memorable of her career. Back at Warners, though, she gave a not-so-memorable performance as a Congresswoman in 1951's dull Goodbye, My Fancy. After several years of films for Warners that were less-than-successful both financially and creatively, Joan's association with the company had obviously become unsatisfactory to both parties. In an attempt to edge her out of the studio, Jack Warner purposely offered up the sub-par This Woman Is Dangerous as her next vehicle. To his chagrin, she accepted the role of a criminal-gang mastermind who falls in love with the doctor who operates on her. But the earlier "hint" wasn't lost on Joan: In early 1952, she asked to be released from her contract, and the studio readily agreed. Joan's parting with Warners coincided with the greatest upheaval in the movie industry since the advent of talking pictures in 1929: the simultaneous decline of the studio system and rise of television as the prime source of entertainment for the American public. In 1951, the U.S. Justice Department had ordered the movie studios to divest themselves of their large theater chains, thus depriving the studios of a guaranteed outlet for their product. At the same time, the new medium of television was reaching an increasingly large number of households: In 1948, 1 million homes had TV; in 1951, 12 million; by 1955, half of all American homes had television. This new source of free entertainment caused a drastic drop in movie attendance. Between TV and the no-longer-guaranteed theater venues, the studios were forced to scale back operations, dropping employees ranging from grips to major stars from their regular payrolls. The studio system that had been in place since the late 1920s was in effect kaput. Joan rebounded from the loss of a steady employer by signing on with an independent producer (and also acting as an uncredited executive producer herself) for the stylish RKO noir Sudden Fear. Joan plays a lonely, wealthy playwright who marries a rather sinister younger actor (Jack Palance), who may or may not be trying to off her... The writing and acting for Fear were top-notch, the film was a hit, and Joan was again nominated for an Oscar. 1954 brought the now critically acclaimed Republic Western Johnny Guitar. Joan plays Vienna, a tough saloon owner reunited with her lost love and forced to defend herself against rampaging townspeople, led by Mercedes McCambridge as "Emma Small." While the film is praised today by such luminaries as Martin Scorsese and Francois Truffaut and various other critics for its "hallucinatory" quality as well as its aspects of "Greek tragedy," "political allegory," sexual subversiveness, and high camp, at the time of its release it was largely dismissed as being merely an overly pretentious potboiler. Joan herself was embarrassed by the picture and said years later, "I should have had my head examined. No excuse for a picture being this bad or for me making it." The public at the time seemed to agree. Joan's two pictures of 1955 veered back toward less surreal, more familiar soap-opera territory: In Female on the Beach (a lesser version of Sudden Fear), she's a rich, lonely widow courted by the not-quite-trustworthy beach bum Jeff Chandler; in Queen Bee (a Harriet Craig knockoff), she's a manipulative meany who dominates her family with her sharp tongue and sexual voraciousness. In the early '50s, Joan's unhappiness in her personal life had begun to exhibit itself with an increased number of sexual partners as well as an increased alcohol intake. 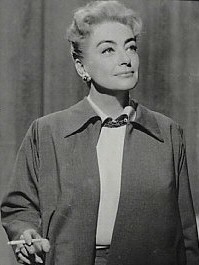 The tabloid press was rife with tales of her sexual exploits, both real and imagined (running the gamut from Yul Brynner to Rock Hudson to a local bartender to an anonymous trucker who had supposedly beaten her up), as well as tales of her misdeeds on movie sets such as Johnny Guitar, for instance, where she did indeed throw Mercedes McCambridge's clothes out onto the highway in a drunken fury. 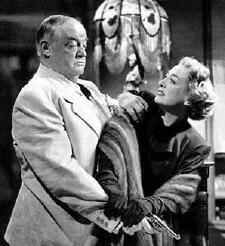 After her 1946 divorce from third husband Phillip Terry (whom she later admitted she married out of sheer loneliness), Joan's most serious relationships had been with lawyer Greg Bautzer--a renowned ladies' man--and the already-married director Vincent Sherman, neither of which proved very satisfactory. Her home-life with her children was also in shambles by the early '50s. Her 11-year-old son Chris had already run away from home several times; and the police had been called when Joan and daughter Christina had gotten into a physical brawl at their home. Though Joan got along well with her youngest daughters, twins adopted in 1947, by 1954 all four children had been sent away from home to boarding schools. Enter Pepsi-Cola Chairman Alfred Steele. 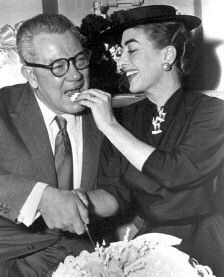 He had called Joan to say hello on New Year's Eve 1954 while she was spending the night alone on the set of Female on the Beach. By May 1955 they were married. In Steele, Joan found a man as accomplished and ambitious in his field as she was in hers, and one not subject to the same insecurities that her previous three actor-husbands had been. His company activities also gave her a new outlet for her energies, and she loyally became an active promoter of Pepsi, traveling frequently with her husband in support of the company. Steele also provided financial security: Once Joan was no longer under contract to a studio or receiving a regular paycheck, she'd been forced to shut down rooms in her Brentwood home and had been unable to pay her children's school tuition regularly. Now, the tuition was promptly paid and Steele purchased a deluxe New York City apartment for the couple's new living quarters. By 1957 Joan had sold her Los Angeles home of 30 years and become a New Yorker for the first time since her showgirl days in the early 1920s. While giving her much-needed stability on the home-front (and tons of publicity), Joan's new marriage didn't lessen her need for personal recognition as an actress and star. In 1956 she gave one of her most sensitive and intense performances in Autumn Leaves, a Robert Aldrich-directed portrayal of an ageing typist who falls in love with an at-first-attentive, then abusive and psychotic, younger man (Cliff Robertson). She followed up with 1957's The Story of Esther Costello, playing a rich woman who adopts a poor deaf-blind-mute girl; the two eventually hit the inspirational lecture circuit before Joan's caddish ex-husband re-enters the picture and preys on the hapless Esther. Joan was an uncredited co-producer of the film, which was shot in England. 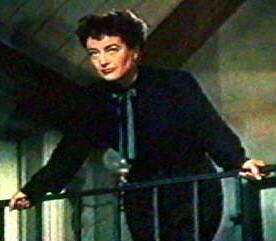 Though Joan later called this her "last really top picture" and the film was nominated for several British awards, both her acting and the film seem done by rote. In 1959, Alfred Steele died of a heart attack at the couple's apartment. In recognition of her support of the company over the past four years, Joan was named to the Pepsi board of directors a few days later, an association that would continue for the next 14 years. Shortly after Steele's death, Joan's friend, producer Jerry Wald, offered her a small role in his latest film The Best of Everything to keep her mind off her loss. The film was basically an anti-feminist harangue disguised as a candy-colored froth-fest and was designed to feature 20th Century-Fox's new crop of stars (Hope Lange, Stephen Boyd, Suzy Parker, etc.). Joan's part as the shrewish editor Amanda Farrow was as unflattering as it was small. But it was work, which was the new realistic mantra that Joan would adopt for the final decade of her career.